We all know how important it is to be safe in the workplace and to take every precaution at our events and campaigns to ensure people are being taken care of. That's where our safety lanyards come in. These lanyards come with a breakaway clip included in their cost which release when there is a certain amount of pressure on the lanyard. 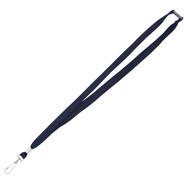 This makes sure that no one gets choked by their lanyard and is a great comfort to those who fear their lanyards might get caught in day to day activity.